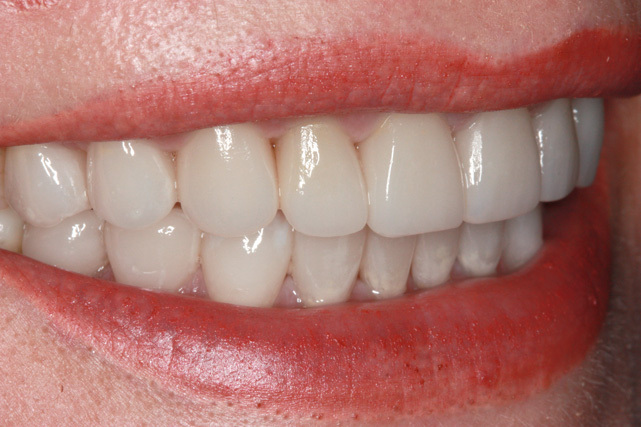 Treatment Goals: Restore proper vertical dimension of occlusion, restore proper canine guidance, establish proper gingival contours and tissue harmony, establish a stable occlusion and improved esthetics. 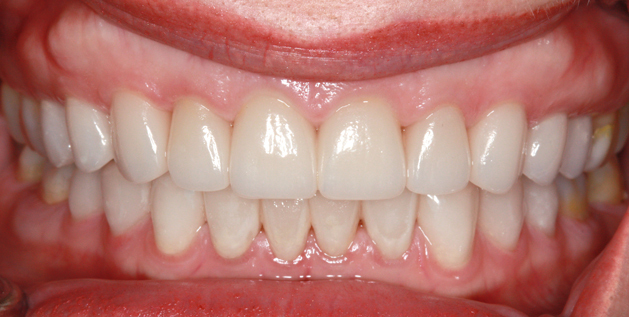 Prior to treatment, an occlusal splint was used to reestablish a comfortable jaw position and occlusal relationship. 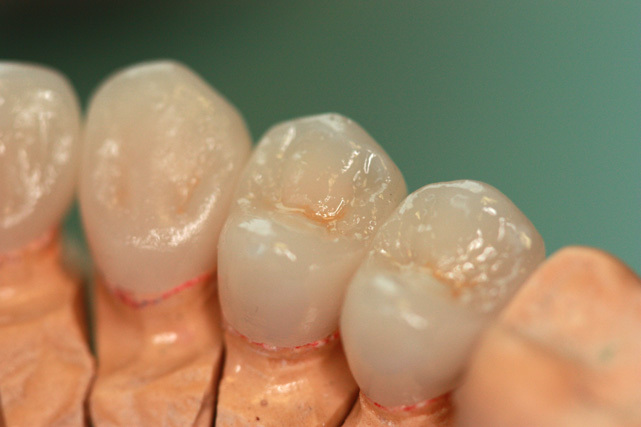 A diagnostic wax up was used to fabricate a guide to aid in the laser gum surgery. 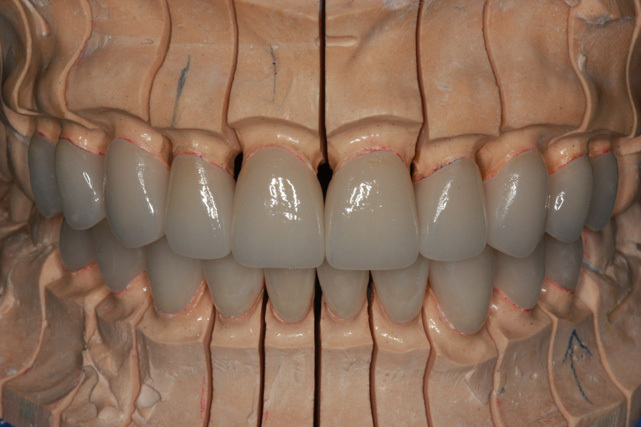 Gingival heights were based on esthetics and level of attachement. 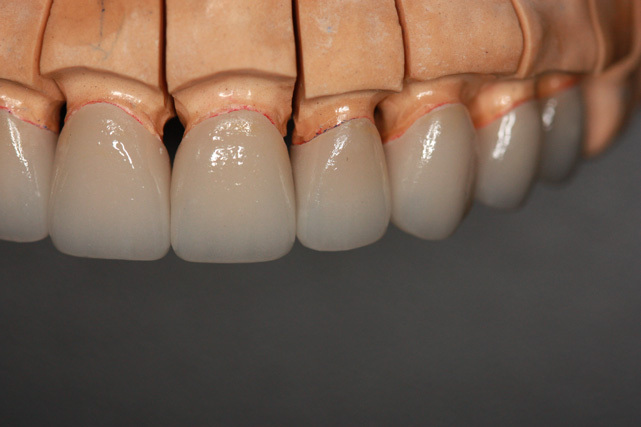 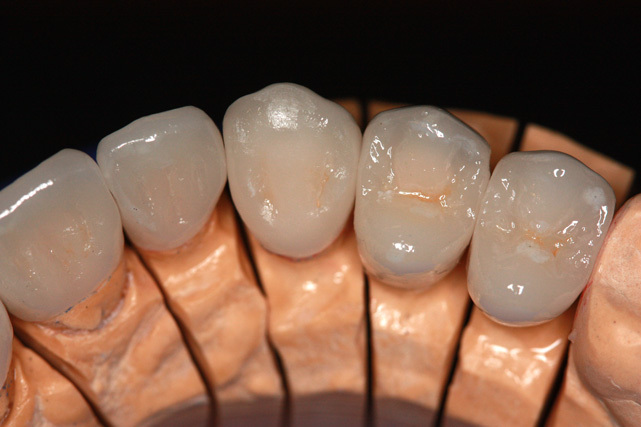 The wax-up as well as the unglazed bisque crowns were tried in to verify an accepted esthetic result. 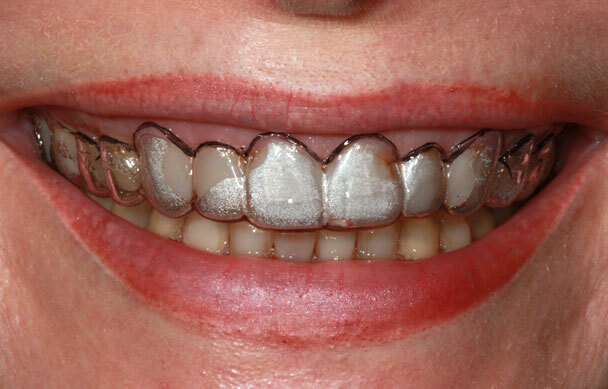 The final outcome took approximately 4 months to complete. 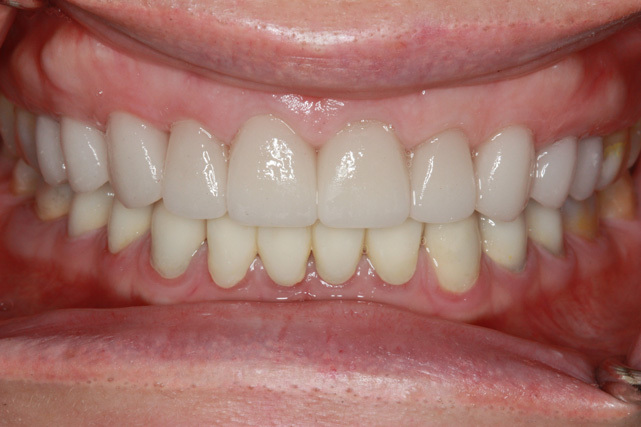 Because of limited finances, the patient chose to complete the upper and lower 10 front crowns now and the back crowns at a later time. 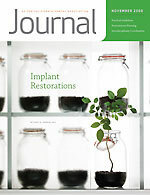 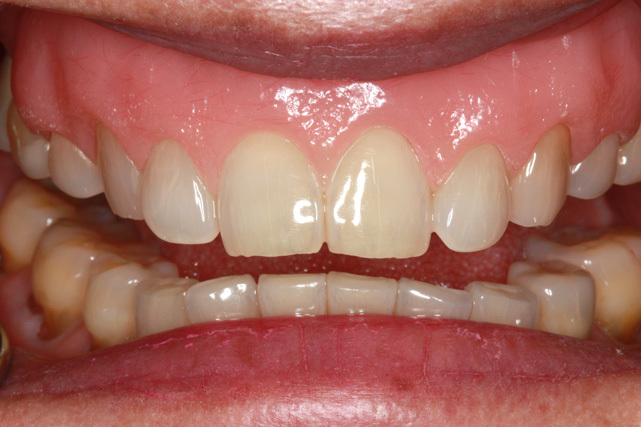 Temporary occlusal composites were used to stabilize the back teeth until further treatment. 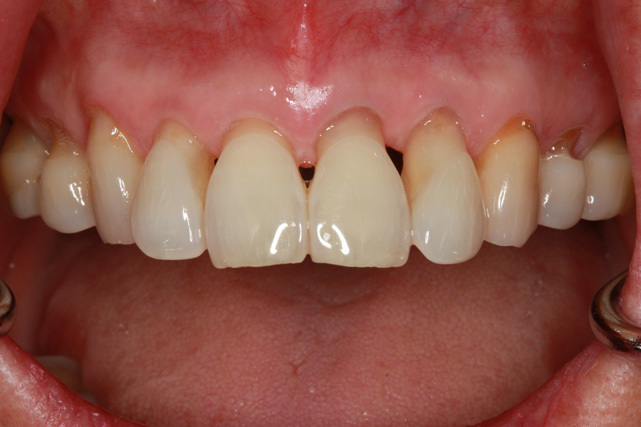 Here is a cost effective way to treat a patient who had a history of periodontal disease followed by subsequent bone loss and recession. 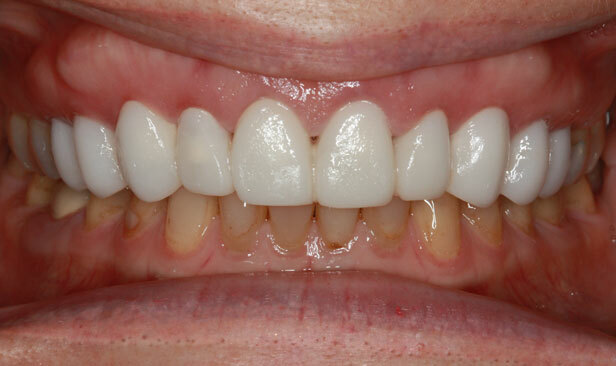 This patient’s current periodontal condition is now controlled. 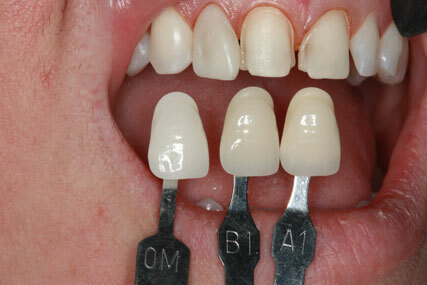 Pocketing depths are 2-3mm, tissue levels are stable and routine periodontal cleanings every 4-6months. 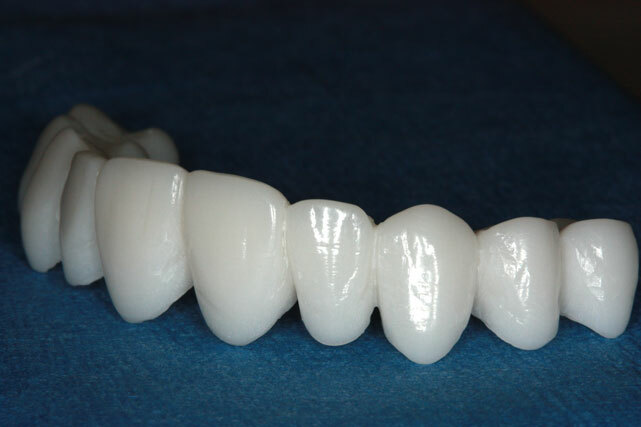 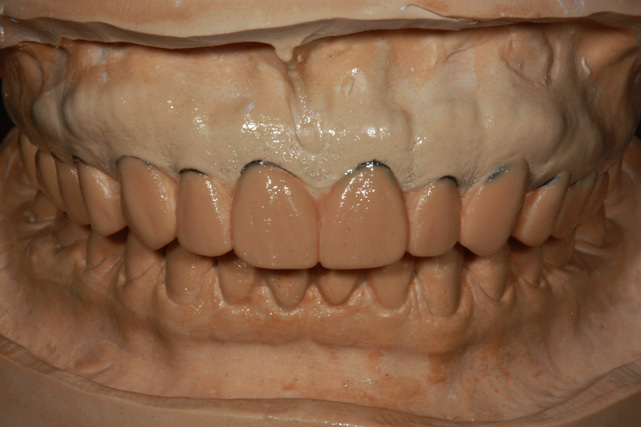 Treatment: We fabricated a removable cold cure acrylic resin prosthesis from a mock wax-up on a solid cast. 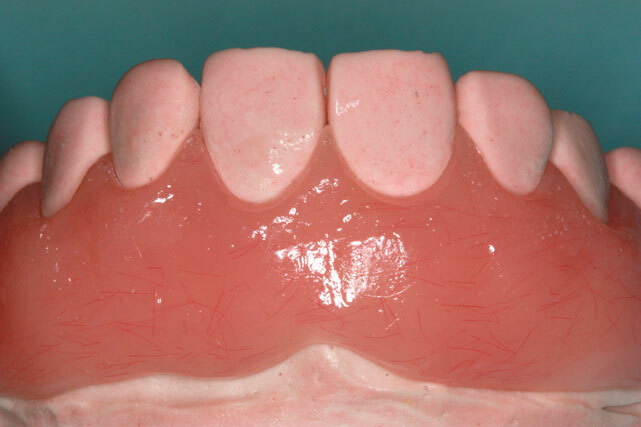 The cast was carefully surveyed and blocked out to allow a path of insertion while still maintaining some retentive undercuts. 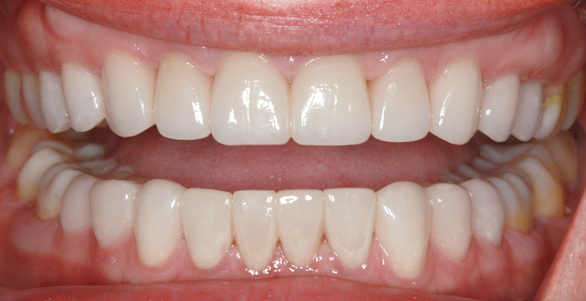 Advantages: Cost effective, predictable long term result, non-surgical alternative. 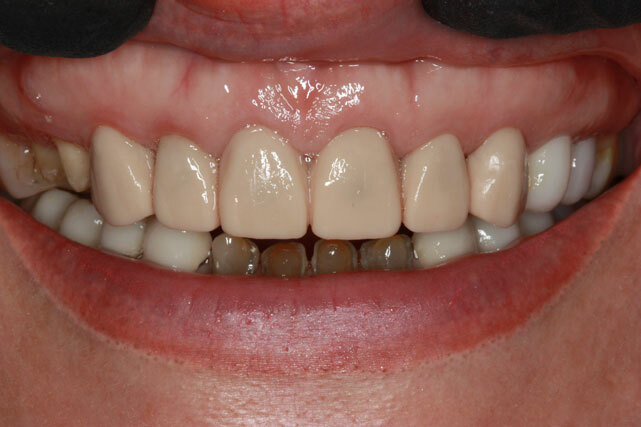 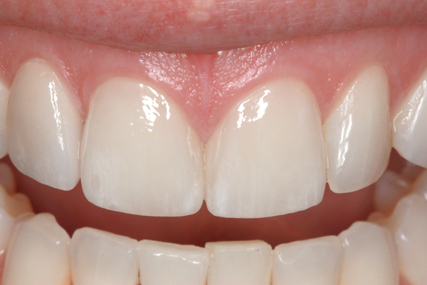 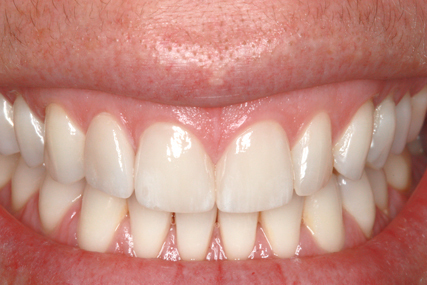 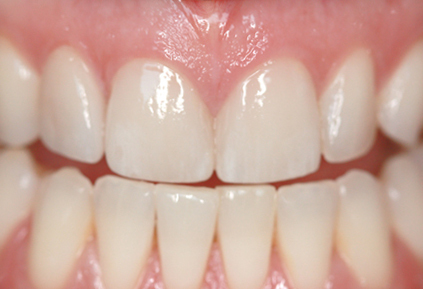 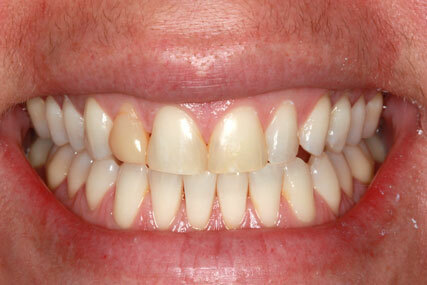 This patient presented with discolored composite veneers on #7-9. 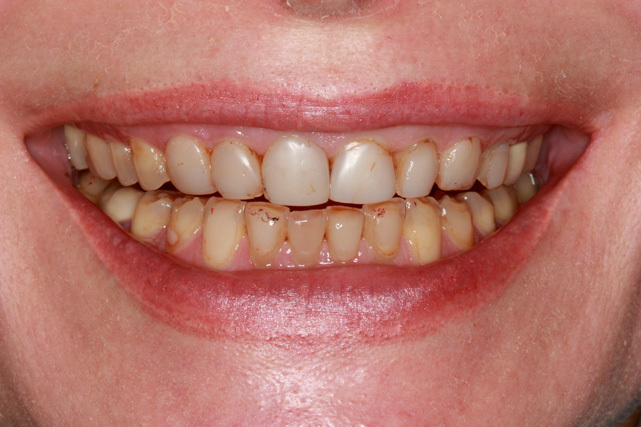 She was unhappy with the esthetics and wanted to improve her smile with a better type of restoration. 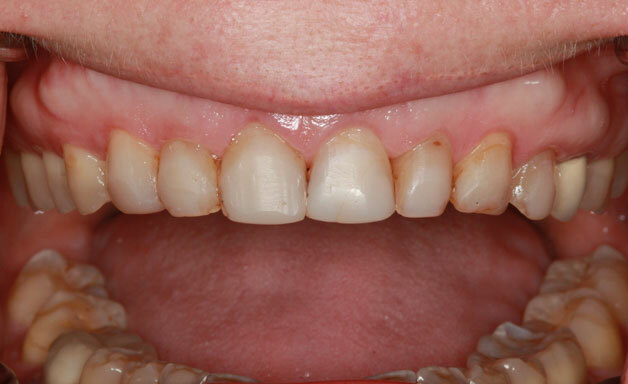 There was a pre-existing diastema between #8-9 and midline discrepancy. 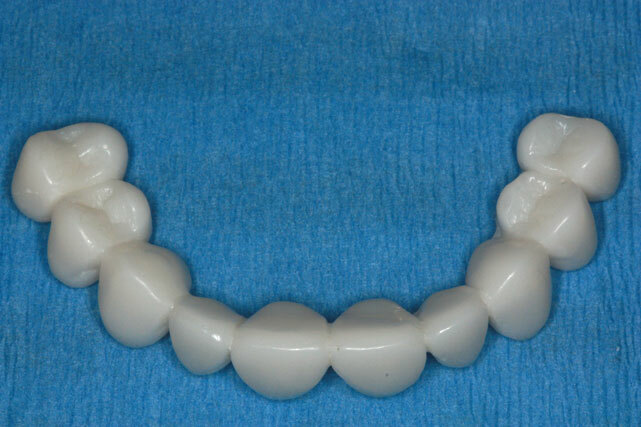 Upper and lower teeth met edge to edge with only a slight horizontal discrepancy. 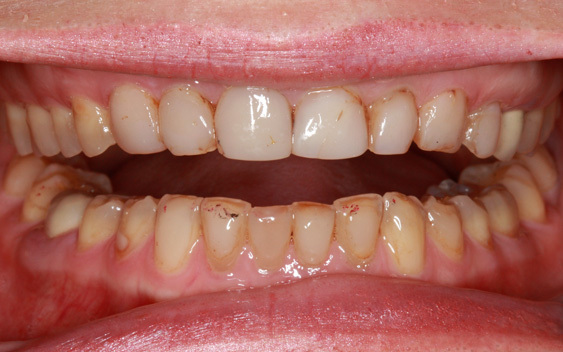 Gingival harmony was within normal limits. 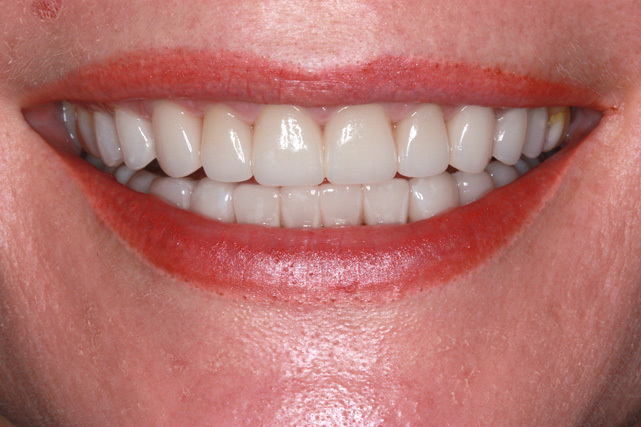 Treatment plan: We decided to whiten her teeth prior to replacing #7-9 with conservative porcelain veneers.